Then I put my creative juices to good use and think of a décor and thank you gift to give them for taking some time from their lazy Sunday to be with me. I’m not going to lie; these get-togethers have become a really big thing for me. Never undervalue the power of girlfriends. While I considered my husband one of my best friends, and as much as I value his opinions and feedback, he will never be able to give me a woman point of view on certain experiences. This awesome group of chicas have help me see situations and challenges from different perspectives, they are great listeners and are super creative, which makes them great brainstorming allies. We champion each other, because let’s be honest here – we tend to never see our own potentials - but are quick to see it in others and challenge them to step it up. Woman are nurturing and feed our soul – after our Sunday brunch I always tend to feel good and energized and our conversations and actions just inspired me to take on the world – or in this case the start of a new work week. So this past Sunday we were back on with Chica Brunches and I believe it was one of the best one to date. We had yummy food, the wine slushy that is a big hit, some tasty mimosas and I treated each one of them to a thank you gift. 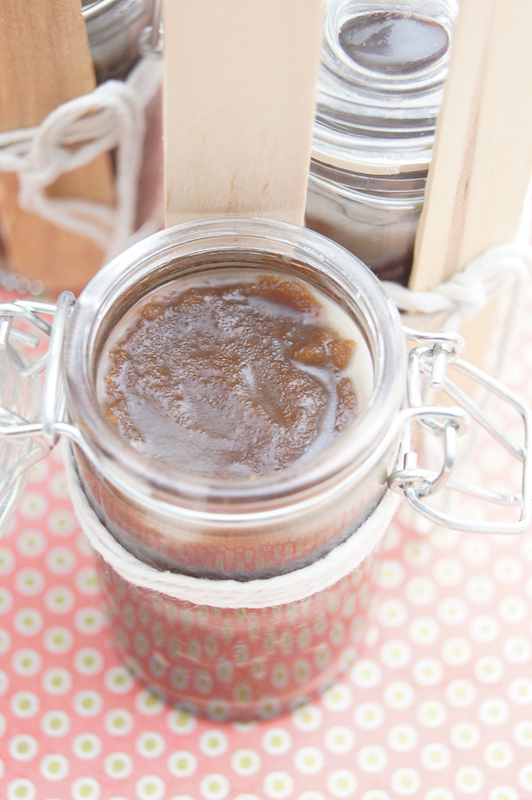 I knew I wanted to give them something homemade, and since the Organic Sugar Scrub was such a hit with them, something to nurture their body was totally in the cards. After lots of search and ideas overload with Pinterest, I found the perfect gift. Behold the splendid (and cheap) Brown Sugar & Vanilla Lip Polish. It’s simple to do, cute to package, delish to eat (I’m not kidding here) gives great results and unlike the inspiration very affordable. You can thank lots of pinner in Pinterest for the final combo recipe. In a small bowl, stir coconut oil, honey, vanilla extract, and vitamin E together. Then, mash in sugar. Warm slightly (with your hands, a microwave, whatever) if it’s not coming together easily. Don’t panic if it makes you do a workout when mixing, an the coconut oil tends to give a “oily” feel, but keep mixing and it will come together. That’s it! Store in a cute jar and enjoy your new, smoother lips! 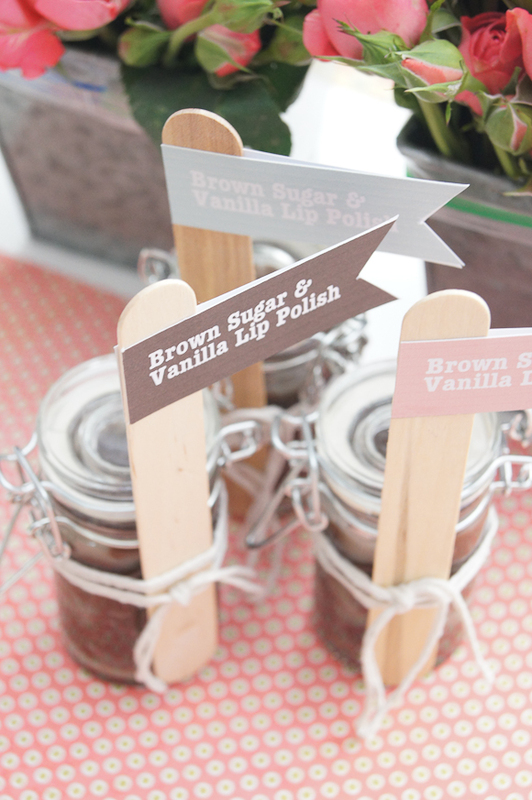 Note on the supplies – Cute containers, I used my left over containers from my bridal shower which my MOH found at Michael’s, but you can also check these places out for more containers idea: Option 1, Option 2 and there is always the great Etsy. I then used some twine to wrap around the bottle and then stuck a popsicle stick which became the pole holding my colorful flags pre-printed with the name of the Lip polish. 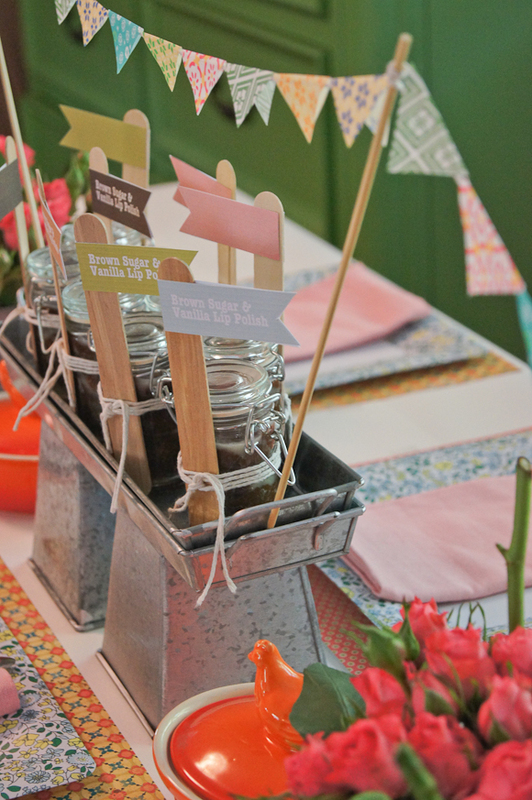 You set up in a cute arragement and voila, your guest will love them. Kinda cute don’t you think?